This is my eightieth consecutive Trove Tuesday post but I thought my run would end at 79. Yesterday I took a tumble and now have soft tissue damage in my knee and after a late night in the emergency department, things weren’t looking good for an eightieth Trove Tuesday post. 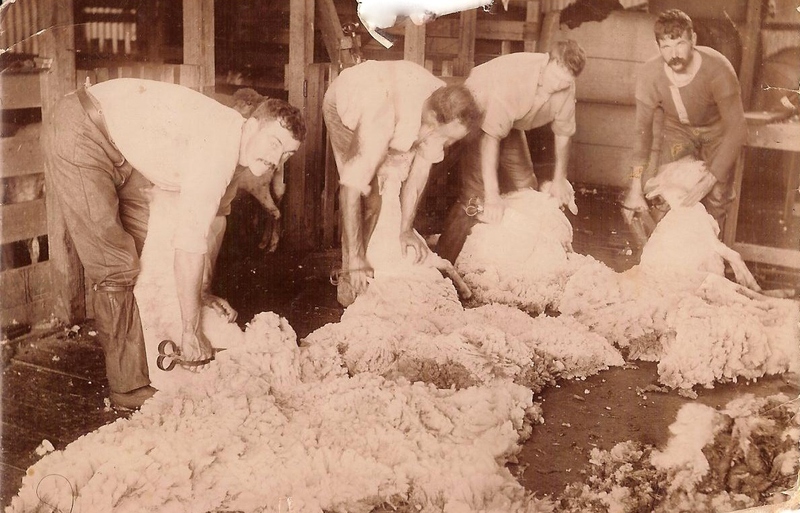 Thankfully, I had started the post over the weekend, so I thought I would give you what I have so far and finish next Tuesday with the relationship between the subjects in my article, found once again at Trove. Over the past weekend, the R.A.A.F. celebrated 100 years of military aviation with an air show at the Point Cook R.A.A.F. base. So, I thought it was a good time to share an article I found about my gg uncle Charles James Harman, I found in the Hamilton Spectator when the paper came online in 2013. Charles was the son of Reuben James Harman and Lizzie Bishop and grandson of James Harman and Susan Reed of Byaduk. He has had a post here before, about the time he took a flight in the R101 airship. Charles Harman joined the Australian Flying Corp in 1915 as aFlight Sergeant and over the course of the war rose to an officer ranking with the No. 1 Squadron of the A.F.C. He spent most of the war in Egypt and mid-way through 1916, wrote home to his mate and business associate, Arthur Parfrey of Macarthur. Arthur passed the interesting letter across to the Hamilton Spectator and the paper published it on 14 September 1916. 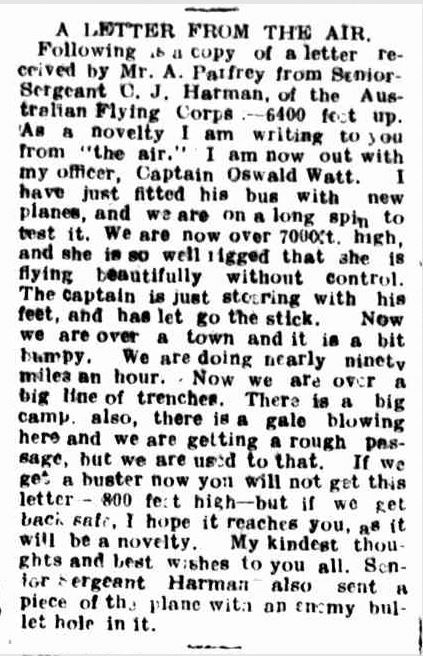 The flight he writes of was with pilot Oswald Watt as they reached heights of 7000 feet. Considering the planes the then Major Watt was flying, they were daring. Oswald Watt’s biography is available to read at the Australian Dictionary of Biography. This entry was posted in Trove Tuesday and tagged AFC, Harman. Bookmark the permalink. WOW! Congratulations on 80 consecutive posts. Huge Effort. I am very impressed. Hope that the knee heals soon. Thanks Sharon. Still struggling with the knee but it is on the improve.